Garnets, with their wide range of colors and varieties, have long been an important gem material throughout history with research dating their use back to the earliest known civilisations. This fruit may have given garnet its name. It would have been easy if nature presented us with pure family members but, unfortunately for those trying to classify garnets, this is not the case. The family members listed above represent “end members” within the garnet group. In other words, their composition is an ideal, theoretical one. In reality, all the garnets we use as gem materials are a mix of two or more end members in various ratios. Some of the magnesium which makes a pyrope a pyrope can be replaced by iron or some of the iron that makes an almandine an almandine is replaced by manganese. In gemology, this ‘mixing of end members’ is called isomorphous replacement. The composition of a garnet determines certain measurable characteristics of the stone such as refractive index and specific gravity. It can also influence the color of the stone, which is why garnets come in many colors and shades. The confusion which occurs from these mixed garnets, together with marketing strategies, have caused an array of trade names to be invented for various garnets. While it is scientifically correct to call the green garnet found in Kenya a green grossular, the gem trade insists on (erroneously) calling it Tsavorite. It sells better that way. Some names are relatively new and are still being contested, others have been in use so long that they have gotten a firm grounding in literature and have been adopted by gemologists. It is important to remember that, at the end of the day, all garnets are a mix of two or more of the end members mentioned above. 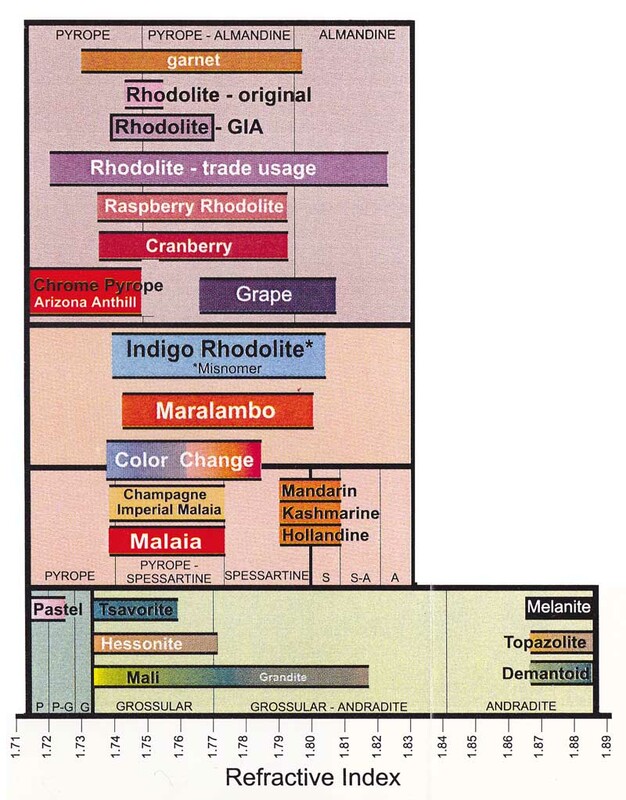 Diagram Describing the Composition of Garnets by Their Trade Names. By W. Wm. Hanneman, Ph.D. © W.Hanneman, reproduced by AJU with permission. 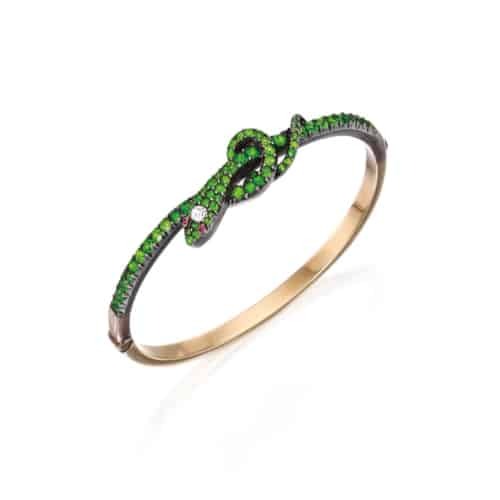 Victorian Demantoid Garnet Snake Bracelet. c.1880. Garnets have been used, wherever they occur, for as long as mankind can remember. From predynastic Egypt to the discovery and hype of Fanta orange garnets in Tanzania in 2007, garnets have never ceased to capture our attention. The Roman writer Pliny mentions gemstones called carbuncles, some of which are thought to be garnets. The red family member, almandine, was a very popular gemstone with the Germanic tribes that inhabited northern Europe during Roman times. 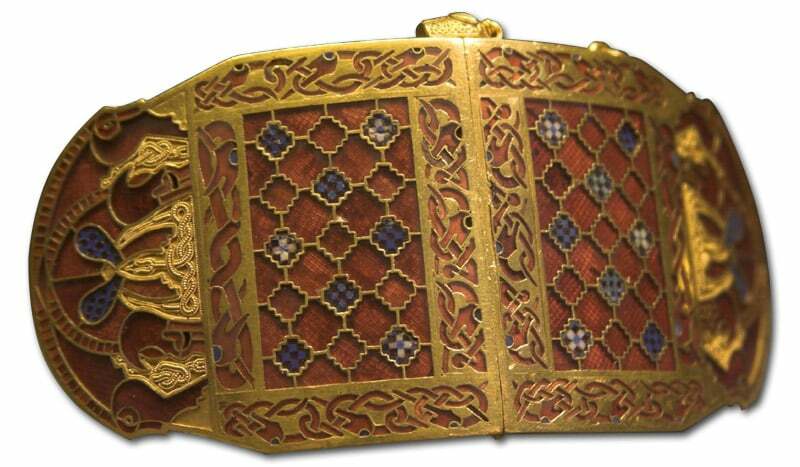 They were used for cloisonné inlay work of which items found at Sutton Hoo are a great example. Sutton Hoo Shoulder Clasp, Closed. 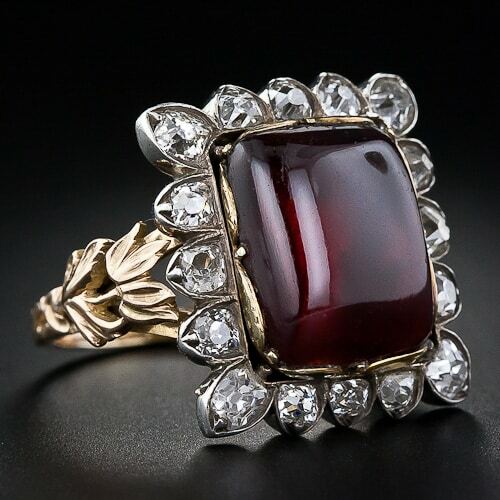 During the Victorian era garnets were extremely fashionable; rose cut garnets from the Czech Republic often covered entire jewelry items. 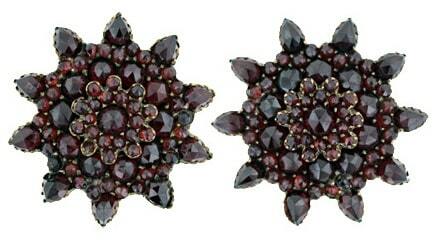 These garnets are better known as Bohemian Garnets after the area they were mined: Bohemia. Andradite was discovered in the Ural Mountains of Russia circa 1853. This distinctively bright green garnet was given the name demantoid in 1878. It quickly became a “hot” gemstone punctuating ‘turn of the century’ jewelry. 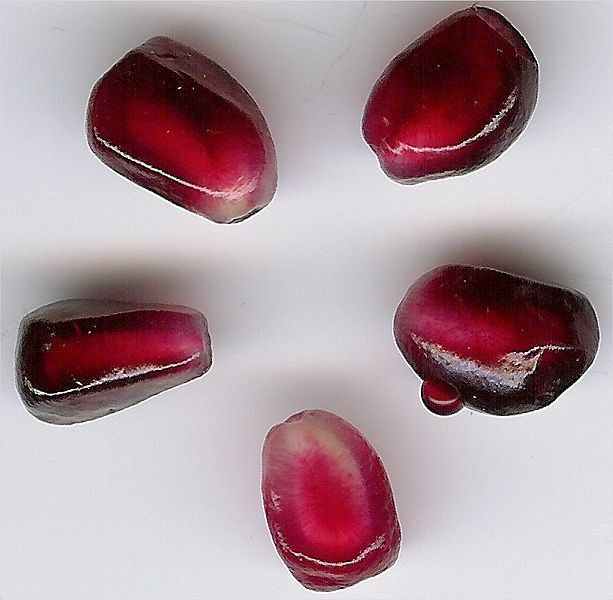 In the last quarter of the 20th century, various additional garnet varieties have been found in Africa. Wilson, Mab. Gems. New York, NY. :The Viking Press, 1967. July-Aug. 1934, Unusual Garnets, p. 125, 2pp. Summer 1945, Absorption Spectra of Pyrope Garnet, by Anderson, p. 232, 2pp. Fall 1945, p. 257, 2pp. #3: Spring 1946, p. 301, 3pp. Summer 1947, Distinction Between Garnet and Corundum, p. 435, 1p. Fall 1947, The Garnet. Past and Present, p. 465, 3pp. Spring 1948, Pyrandine, A New Name For An Old Garnet, by Anderson, p. 27, 1p. Winter 1950, Garnet Produced from Madagascar, p. 378, 2pp. Summer 1953, Demantoid, by Ehrmann, p. 317, 1p. Summer 1954, Third Find of Rhodolite Garnet; Discovered in Greenland by John Sinkankas, p. 63, 1p. Fall 1960, A 19.65 ct. Hessonite Garnet (showing absorption spectrum), p. 72, 1p. Fall 1960, Cat’s-Eye Demantoid, p. 92, 1p. Fall 1962, A Ruby Red 16 ct. Chrome Pyrope (Showing Absorption Spectrum), p. 339, 1p. Spring 1963, Pink Grossularite Garnet, p. 23, 2pp. Summer 1963, Massive Grossularite from S. Africa, by Webster, p. 35, 4pp. Summer 1966, Hydrogrossularite Garnet from the Transvaal, p. 49, 9pp. Fall 1966, p. 74, 4pp. Winter 1966, A 17 ct. Faceted Uvarovite Garnet (Showing Absorption Spectrum), p. 113, 2pp. Spring 1968, A Ruby Red 4.27 ct. Chrome Pyrope, p. 279, 1p. Winter 1968, Transparent Green Grossularite, p. 375, 1p. Spring 1969, Tanzanian Garnets, p. 15, 2pp. Summer 1969, Emerald-Green Grossularite Garnet, p. 58, 1p. Summer 1969, A 2-Phase Inclusion in Garnet (First Seen), p. 67, 2pp. Winter 1969, A fine 6 ct. Demantoid Garnet Showing Horsetail Inclusions, p. 121, 2pp. Spring 1970, New Transparent Green Grossularite Inclusions, p. 151, 2pp. Spring 1970, Alexandrite-Like Garnet from Tanzania, p. 162, 1p. Summer 1970, A Rare Alexandrite Garnet from Tanzania, p. 174, 4pp. Summer 1970, Spessartite Garnet Inclusions, p. 189, 1p. Summer 1970, Spessartite Absorption Spectrum, p. 197, 2pp. Summer 1970, Grossularite Garnet Inclusions, p. 196, 2pp. Fall 1970, Testing Demantoid with Ultra-Violet Light, p. 226, 2pp. Fall 1970, New Transparent Colorless Grossularite from Tanzania, p. 227, 3pp. Fall 1970, Alexandrite Garnet from Norway, p. 229, 1p. Fall 1971, A Massive Hydrogrossular Garnet Cut in Cabochon (One end Pink, the Other End Green) (Showing Absorption Spectrum), p. 354, 3pp. Summer 1972, Two Unusual Rhodolite Property Variations, p. 40, 1p. Spring 1973, A Typical Demantoid Inclusion, p. 150, 1p. Summer 1974, Green Grossularite Garnets, “Tsavorites” on the Kenya-Tanzania Border, p. 290, 6pp. Summer 1974, Composition of “Tsavorites” from Kenya and Tanzania, by Switzer, p. 296, 2pp. Fall 1974, Jewelry Repair Involving Garnet and Glass Doublets, Dangerous, p. 344, 2pp. Fall 1974, Some Unusual Inclusions in Hessonite and Rhodolite, p. 349, 2pp. Winter 1978, Blue to Red Colour Changing Garnet from East Africa, p. 122, 2pp. Winter 1978, Demantoid Garnet from Korea; Alexandrite Garnet from East Africa, p. 123, 3pp. Summer 1979, Colorless and Green Grossularite from Tanzania, by Pieter Muije, p. 162, 12pp. Fall 1979, Unusual Gem Garnets of East Africa, p. 218, 2pp.